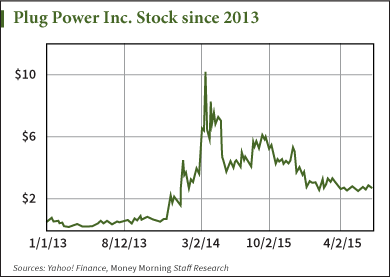 Subject: Is Plug Power Inc. (Nasdaq: PLUG) a Good Investment? It climbed 565.2% in three months, settling at $10.31 by March 10, 2014. But PLUG stock got hurt when short seller firm Citron Research released a report that, among other things, accused management of misleading investors and breaking promises left and right. The firm pointed out that Plug Power consistently failed to meet guidance on fuel cell shipments and revenue. Citron deemed the stock a "speculative moonshot" – a "casino stock." Citron Executive Director Andrew Left put a $0.50 price target on PLUG stock. PLUG stock is down 74% since its March 2014 highs and has a rather high short interest – a percentage of investors shorting a stock – of 19.3%. The S&P 1,500 has an average short float of about 6%. But is Left right? Is PLUG stock an overhyped penny stock with little value over the long haul? Or is PLUG stock a buy? What Does Plug Power Inc. (Nasdaq: PLUG) Do? For several years Plug Power was a hydrogen fuel cell company trying to find its identity. In the first decade of its existence, beginning in 1997, Plug Power's main commercial product was GenCore, an on-site electricity generation system using hydrogen fuel cells. GenCore would provide back-up power for telecommunications, broadband, and utility applications. But in April 2008, with the arrival of CEO Andrew Marsh, the company shifted focus. Marsh saw a thin market for the GenCore back-up systems and instead built the company around the GenDrive product line. GenDrive is centered on hydrogen fuel cell batteries for forklifts in distribution centers. The aim is to replace cumbersome lead-acid batteries, with a more fuel-efficient alternative. GenDrive aims to keep forklifts running at full speed for longer than the lead-acid alternatives, reduce operational costs, produce zero emissions, and provide for more commercial space as distribution centers do away with battery rooms that typically take up 7% of these warehouses. Plug Power was helped in part by an eight-year extension in October 2008 of an investment tax credit for fuel cell technology, for which the GenDrive product line qualifies. This has helped Plug Power amass an impressive portfolio of business clientele. Its largest customer is Wal-Mart Stores Inc. (NYSE: WMT), but other notable customers include Sysco Corp. (NYSE: SYY), Procter & Gamble Co. (NYSE: PG), Kroger Co. (NYSE: KR), and the Coca-Cola Co. (NYSE: KO). Despite Marsh's push into what was perceived to be a more profitable business line, PLUG stock was struggling. PLUG stock traded for less than $1 beginning in August 2012, and it took until December 2013 for the stock to push back over that figure. In that time, the Nasdaq exchange threatened to de-list PLUG stock. PLUG stock traded as low as $0.12 on Feb. 26, 2013. But, PLUG stock began to take off in December 2013 when Marsh said he planned on the company delivering $70 million in revenue for 2014. Since 1997, Plug Power has failed to turn a profit. To that point, the company had accumulated a net loss of $849.7 million and delivered a cumulative negative $15.78 earnings-per-share figure. Correction: Original copy stated Marsh promised $70 million in PROFIT, while he actually promised $70 million in SALES. It has since been corrected. Thanks to twitter user @wind4me for pointing that out. when Home Depot (Big Box Retailer) and NIKE or Adidas (Global Shoe Maker) added to VW, Kroger, and monster customer Walmart, you will see the stock price DOUBLE by end of year!! good article . But you see we who bought PLUG POWER need support. We bought this because we want a clean GREEN america. For our children we need clean environment. PLUG is decreasing costs of Wall Mart , BMW, FEDEX , Mercedes , Kroger, Home Depot , NIKE , Adidas etc… at the same time output is clean air. No environment problems. So please support us .. If you like also Green Energy..
we will be waiting your new articles.. Your article is nice . Thank you. If you publish in Stock Twists or Tweeter . We will read it..